Offering beautiful views of Kowloon East and Victoria Harbour, the 4-star Regal Oriental Hotel features 4 dining options and 24-hour room service. Free Wi-Fi access is available in the entire property. The hotel is located in the heart of Hong Kong's heritage district Kowloon City, only 600 metres from Kowloon Walled City Park and 1.5 km from Wong Tai Sin Temple. Spacious and modern air-conditioned rooms are fitted with double-glazed windows and a flat-screen TV. A personal safe and a well-stocked minibar are included. En suite bathrooms are equipped with a bathtub and a hairdryer. 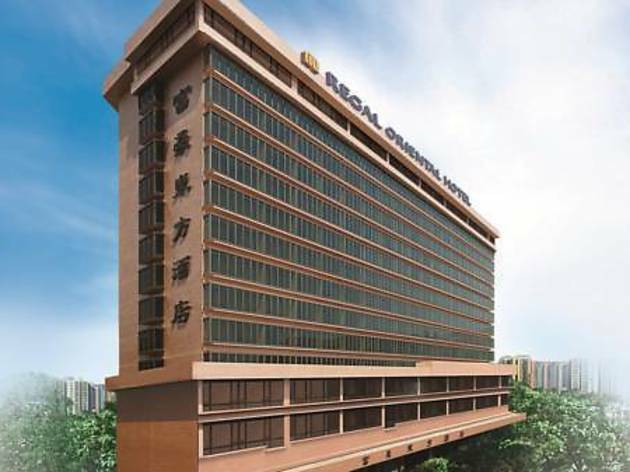 Regal Oriental Hotel is 15-minute drive from Mong Kok Ladies' Market and less than 5 km from Avenue of Stars. The hotel's shuttle bus takes guests to Airport Express Kowloon Station and MTR Hung Hom Station, at an extra charge. There is also a minibus service outside the lobby to bring guests to Mong Kok. The fitness centre on the 3rd floor is well-equipped with weights, treadmills and cardio machines. The hotel also provides a business centre and full banquet facilities. Café Neo offers both Asian and Western fare featuring Hong Kong favourites with delightful surprises. China Coast Pub + Restaurant specialises in a wide selection of burgers complimented by classic American sized dishes. The Chinese restaurant is renowned for its Cantonese culinary. The Regal Patisserie offers a variety of homemade cakes, pastries, salad, sandwiches and bakery delights. Avanti Pizzeria offers a wide array of authentic Italian culinary delights.